In 1988 I had an Apple Elise that would turn on light and appliances using voice command. Butler! "Yes Master" Turn On Lights! "As you wish" - click - light was on. Butler would also play blackjack. Butler! "Yes Master" Hit Me!... Were is home automation now? (CNN) -- The world of automated home gadgets is young and exciting, filled with an abundance of promising new products. It's also a bit of a mess. At the 2013 Consumer Electronics Show in Las Vegas, there were devices and smartphone apps to control everything in your home. But there are so many conflicting approaches, setups, standards and systems that the real dream of a fully connected home is still a ways off. 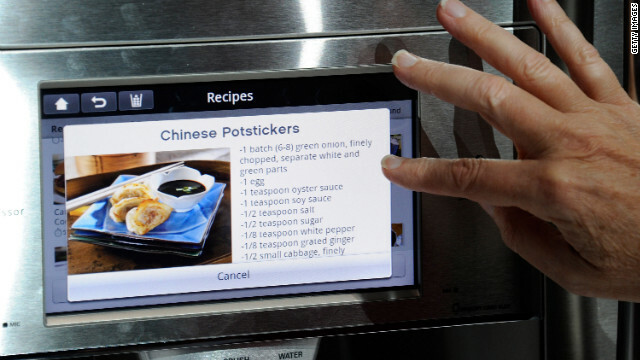 In previous years, the connected, or "smart," home world was mostly aspirational, with prototypes of fridges with Internet-connected displays and elaborate home security systems. But this year the Jetson's home is a finally a reality, with major vendors peddling real, usable products, almost all controllable from a smartphone. There are home security cameras you can monitor from anywhere, motion sensors that trigger lights or send you a text message. A product called Plant Link monitors your plants' moisture levels and texts you when they need water. There is a sensor you can put on your grandmother's teapot that will alert you if she forgets to have her morning cuppa. You can control blinds, check air quality, see if windows are open, unlock your house from halfway around the world for a visitor, or use GPS to have your heater turn on when you're a certain distance from home. The possibilities are endless. How does something as low-tech as a light connect to your smartphone? Typically, the "dumb" end devices (light switch, electrical outlet, thermostat) are outfitted with wireless modules. They communicate using Wi-Fi or other wireless technology with an Internet-connected hub device, which collects the data and bounces it to the cloud. That information is then accessible from a computer or smartphone app, the light controllable with the tap of a finger from anywhere in the world. Unfortunately, with the excited rush to get out new products and try new things, most devices or systems don't yet play well with others. Consider the Philips Hue, a cool, color-changing smart light bulb that's sold in Apple Stores. The bulbs connect to a Philips Hue hub, and you change their colors with the Philips Hue stand-alone app. You can't add a third-party pet door opener or radio controller to the Philips hub, or control them from the Philips Hue app. That means you can't program the kitchen lighting to turn blood red and set the stereo to play "Eye of the Tiger" every time your tabby saunters in for dinner. "Theoretically, they should all work together," said Daniel Moneta, chief executive of MMB Networks, a company that helps equipment manufacturers transform their analog products into smart devices. "But innovation tends to happen at a faster pace than standards." The trend of individual devices and sensors having their own smartphone apps and cloud infrastructure is unsustainable. Imagine having to sort through 50 apps to find the right lock, or opening each app one at a time to set up vacation settings before a trip to Death Valley. Big companies such as Comcast, Time Warner and Lowe's have taken a stab at consolidating smart home technology with their own connected home solutions. They have convenient pre-packaged systems that include the central hub, the smartphone app, and starter devices like security cameras or energy monitors. These systems have their drawbacks. Many charge a monthly fee. They will sell approved additional devices to add on to the network, so it's expandable, but you are still locked into their ecosystem. Then there are the standalone devices that pack the computing power into the object itself, such as the popular Nest programmable thermostat. There's no hub, it just uses Wi-Fi and the Nest app, and it can't connect to other home management systems. "At the end of the day, putting the intelligence into a single device misses the bigger picture," said Jeff Higgins, chief technology officer of SmartThings, a startup working on its own platform for smart homes. For Higgins, who has 95 smart devices connected in his own house, the real power of connected devices is in the apps and writing programs that link objects together. The air conditioner that doesn't turn on because it knows a window is open. To complicate things further, current smart devices don't all speak the same language. There are competing short-range wireless technologies for connecting smart object. In addition to Wi-Fi there's ZigBee and Z-wave, which use less power and are easier to connect. Unlike Wi-Fi, they can be used to create a network of devices that communicate with each other, passing on signals from objects in far off areas of the home. SmartThings will release its own starter kits this Spring, $299 boxes that include a hub and five or six devices that connect to SmartThings app. But the company is planning an open platform that supports all three wireless standards, doesn't charge monthly fees and allows any third-party device to jump on the system and app. Developers can write smaller apps that work inside the main mobile application, coming up with creative ways to link objects together. The startup raised $1.2 million on Kickstarter last year and is backed by some big-name venture capitalists. Whatever the future of smart homes looks like, it will need to be dead simple, affordable and easy to use. There are still potential security and privacy issues that have to be worked out. But the options will narrow down, the technology will become more consistent and a smaller number of remote control apps will crowd your smartphone. Next up, flying cars.